The history of Olive trees and Olive Oil are ages-old. The Olive tree reflects thousands of years of Greek history and tradition. According to Mythology, Goddess Athina gave the Ancient Greeks two presents. She offered them wisdom and the olive tree as a source of wealth. The history of the olive tree dates back to the Prehistoric Times, reference is made to it on 4,000-year-old 3-legged clay Pots. The winners of the Olympic Games were awarded as a prize a wreath made of wild olive tree branches. For the Greeks, the olive tree was always associated with social and economic life. It was closely related with culture, art, poetry, habits, tradition, religion. It was connected with life and death. It was considered a sacred tree and specially protected. It symbolised Peace, Victory, Friendship among Nations and Wisdom. This is the olive oil received from olives through natural procedures only (i.e. squeezing, compression, centrifugation, filtration). There are 4 categories of virgin oil. Virgin Olive Oil:This is the Virgin Olive Oil with an acidity up to 2 grades and a degree of the nutrition facts equal or greater than 6,5 grades. Ordinary Virgin Olive Oil:This is the Virgin Olive Oil with an acidity up to 3.3 grades and a degree of the nutrition facts equal or greater than 3,5 grades. Substandard Virgin Olive Oil:This is the Virgin Olive Oil with an acidity higher than 3.3 grades and a degree of the nutrition facts equal or greater than 3,5 grades. This Olive Oil is received after refining the Virgin Olive Oil (discoloration, deodoration, hydrogenation, neutralisation and other chemical processing). Its acidity does not exceed 0.5 degrees. It is the result of mixing Refined Olive Oil and Virgin Olive Oil. Its acidity does not exceed 1 degree (1g/100g). The great physicians of the Antiquity, like Hippocrates and Gallinos believed in the beneficial impact of Olive Oil on man's health. With its exquisite aroma, unique taste and great nutritional value, it constitutes an essential part of man's nutrition as its fatty acids are at 70-80% monosaturated and at 10% polysaturated, a proportion which is similar to the proportion of mother milk. Pediatrics regard Olive Oil as an important factor of balanced metabolism and development of the brain and bones. Geriatrics regard it as essential in the diet of elderly people because of vitamin E which slows ageing down. Helps to reduce bad cholesterol (LDL) and to maintain the good cholesterol (HDL) in the blood. Has a positive impact on preventing clogging of the arteries and therefore on preventing cardiovascular diseases. Enhances digestion and helps to cure duodenal ulcer. Enhances the good nutrition of diabetics and consequently the balance of sugar rates. Strengthens the immune system of the organism, enhances the good operation of central nervous system. It is exceptionally stable, even at frying temperatures, where other vegetal oils decay dangerously as it contains high levels of antioxydants. The Virgin Olive Oil gives us a warning by changing colour after many fryings, something which does not happen with other seed oils that keep their colour misleadingly and dangerously. Contains several aromatic substances as well as ingredients of the Virgin Olive Oil. (sterols, vitamins salts ,etc) which keep the human organism in very good condition. After several years of study and research, the International Organisation of Health concluded during its 2nd International Congress in San Francisco, USA in 1995 that the M.D. does good to our health and offers longevity. The Organisation presented, for the first time, the Pyramid of the M.D . which is based on the Virgin Olive Oil and the olives, as a model. What does the M.D. include? It includes, regardless of gender or age, the intake of olive oil on a daily basis, a few times a month, several fishes, many pulses, cereals, vegetables and fruits but also potatoes, bread, cheese and yoghurt. 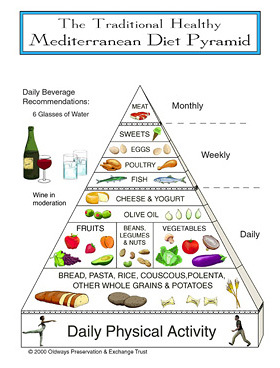 The Olive Oil is very healthy, can be used in all foods and is recommended by all dieticians. It is not more fattening than other oils because it contains the same amount of calories (9cal/gr). For a healthier meal, it can be added at the end of cooking. It works as an excellent conductor of heat. It is highly stable and can be exposed to very high temperatures, as in frying, without undergoing decay. Whereas other vegetal oils go through dangerous denaturation and discolouration, without this being made evident, the Extra Virgin Olive Oil warns us of any discolouration, after many frying uses. Apart from cooking, it can be also used to preserve foods like cheese, vegetables, fish. Greece is the third biggest force of production of Olive Oil, after Spain and Italy, with an average production of 300.000 tons of Olive Oil, coming from 110.000 olive trees. Greece exports more than 50% of its production. The whole area of Messinia is a huge olive grove stretching from the indented coastline of the Messinian Gulf to the roots of the mountain Taygetos. Two premium varieties were born, developed and spread all over the world here in the region of Messinia. 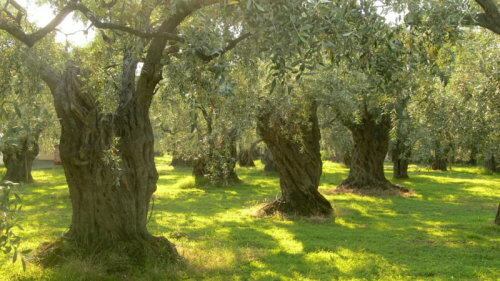 The <Koroneiki> variety, which owes its name to the town of Koroni, is a unique variety of olives, endowed with the bright green colour of the Olive Oil, its rich aroma and fine taste. The <Kalamon> variety mainly intended for the production of table olives, is famous for its firm pulp. The European Union, with the Regulation 1065/97 acknowledged the special properties of the Messinian Virgin Olive Oil and proclaimed it Protected Designation of Origin (P.D.O. ).